The next live broadcast will take place on Tuesday June 12th from noon to midnight in conjunction with The Poor People's March in Washington DC. 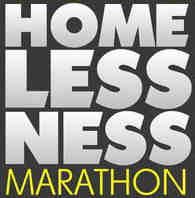 "We tell it like it is"
The Homelessness Marathon's mission is to raise consciousness about homelessness and poverty in America and around the world. We operate on a shoestring budget and the dedication of volunteers, so your contribution will really make a difference.